Composed, arranged, programmed and produced by Richard Sussman. Journey To The Unforeheard: Only the very best music made by humankind over the last four or five centuries creates an instantly-identifiable language all its own that profoundly touches our hearts while reaching for the stars. We live in an age of inclusion and integration that generates global imperatives to work together socially and artistically -- above and beyond any boundaries and limitations of style, genre, category, or culture. 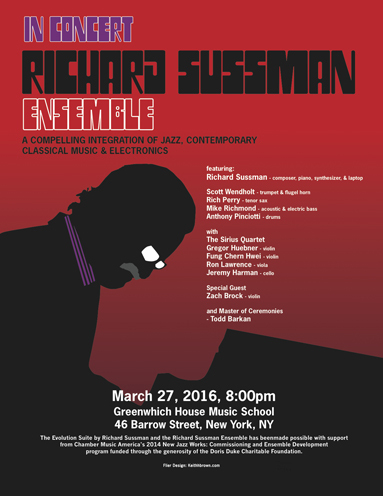 Pianist, arranger, and composer Richard Sussman has been passionately exploring the inner and outer frontiers of contemporary musical expression for the past five decades. I first met Richard when he brought his adventuresome and hard-swinging hard bop Quintet into my San Francisco jazz club Keystone Korner in the late 1970s. Since that unsung era of exciting modern jazz exploration and development in the 1970s and early 1980s, Sussman has continued to be an active and integral member of a whole generation of musical innovators on the cutting edge of contemporary jazz music -- along with Jerry Bergonzi, John Abercrombie, Richie Beirach, Dave Liebman, John Scofield, Randy Brecker, Joe Lovano, Tom Harrell, and so many others. "I've always sought to create my own artistic universe out of the many kinds of music that I love and have been deeply influenced by -- from Horace Silver, John Coltrane, McCoy Tyner, Miles Davis, or Bill Evans, to Bela Bartok, Igor Stravinsky, and Arnold Schoenberg, to James Brown, Ray Charles, Jimi Hendrix, Earth, Wind and Fire, and Aphex Twin," Richard explained. "By combining jazz improvisation and many diverse rhythms and instrumental textures from throughout the world with contemporary classical music, I feel we can more truly reflect and more strongly connect with a wider cross-section of the multi-cultural society in which we live." 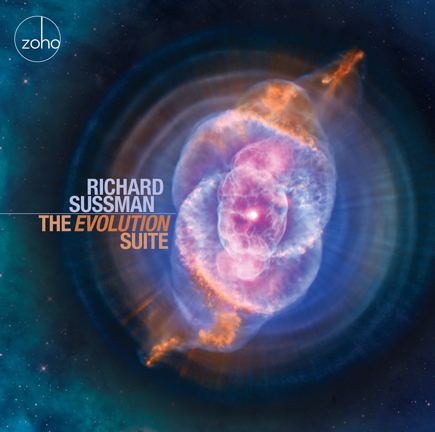 Richard Sussman's ground-breaking The Evolution Suite for Jazz Quintet, String Quartet, and Electronics is the culmination of almost a decade of development. This five-movement, hour-long composition was funded by a Chamber Music America New Jazz Works Grant, and premiered and recorded on December 20, 2015, at the Leonard Nimoy Thalia at Symphony Space in New York City. This is music inspirationally embodying the search for new worlds of sound, about finding new ways to reach welcome but previously unknown places in our hearts. Each and every one of Richard Sussman's partners in time for this journey to the unforeheard is a compellingly unique voice in this music as well. The fiery eloquence of tenor saxophonist Rich Perry, who has been working with Richard since the late 1970s, is also a major force in the Vanguard Jazz Orchestra and the Maria Schneider Orchestra. Perry's soaring solo during the deeply lyrical Second Movement, Relaxin' at Olympus, is one of the emotional highlights of the entire recording. Richard's longtime musical colleague and fellow Philadelphian, Mike Richmond, takes a breathtaking bass solo towards the end of the powerful and genre-defying Third Movement, Nexus. Richmond first gained international recognition through his outstanding playing with the bands of Stan Getz, Jack DeJohnette, Horace Silver, Gil Evans and the Mingus Dynasty, which he led from 1980 to 1985. As always, bassist Mike Richmond helps to powerfully anchor the entire "Evolution Suite." The astounding young violinist Zach Brock is a revelation throughout this recording, especially the trip his solo takes us on as we go to the Nexus in the Third Movement. Zack Brock is an important part of the present and future of our music, as are his fellow virtuosos, the members of the Sirius Quartet - Gregor Huebner, Fung Chern Hwei, Ron Lawrence, and Jeremy Harmon. The quartet does some stunning group improvisation and magical melding with Richard Sussman's imaginative electronic soundscapes in The Music of The Cubes. Trumpeter Scott Wendholt and drummer Anthony Pinciotti are two of the most in-demand players on the current jazz scene. They make the beat sing and melody swing throughout this entire constantly surprising and totally engaging musical journey, with especially great power in the opening Into The Cosmic Kitchen and the surging Final Movement, Perpetual Motion. All of us involved in this project are also deeply thankful for the huge ears and absolutely indispensable work of our supremely resourceful sound engineer John Guth. In the relatively new tradition of the Star Wars Prequels from 1999 to 2005, Richard Sussman has rounded out this musical odyssey with a futuristic, 10-minute piece that was the artistic forerunner to "The Evolution Suite," called Prevolution, which was originally presented to The College Music Society in 2008. Our Father who Art Blakey used to regularly remind us that "if we are not busy appearing, we are disappearing," and Richard Sussman's deeply moving, and ultimately very positive "Evolution Suite" is all about the eternal cycle of composing and decomposing, life and death and life, and the relentless force of never-ending change in the cosmos. ZOHO’s wonderful graphic designer, Jack Frisch, has brilliantly adapted a photograph of a star being born in the Cat's Eye Nebula for the evocative CD cover. May the wonder of our living dreams grow like songs that little children sing, when they feel their first Spring. The Sun gets up slowly; light fills up the room. Egg-shaped in the dawn, the sun bends in bloom. All compositions written, arranged, & programmed by Richard Sussman, ©2016 Richard Sussman Music BMI. The Evolution Suite was recorded live on December 20, 2015, at the Leonard Nimoy Thalia at Symphony Space, New York, NY.